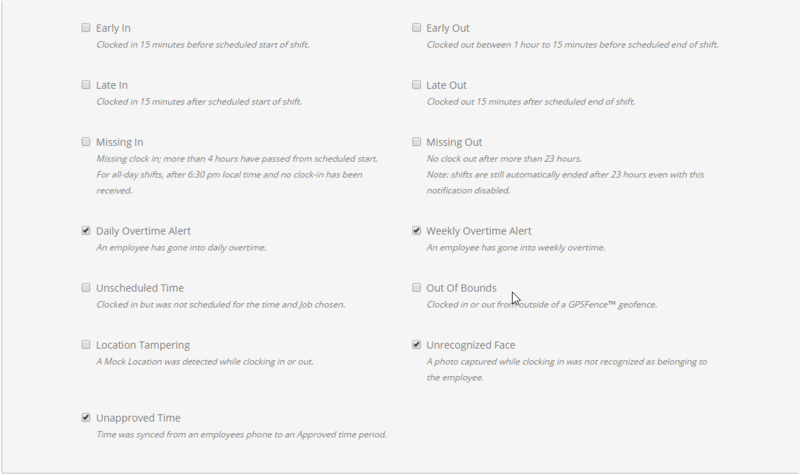 With the Notification features in ClockShark you'll know if anything doesn't go according to the schedule while encouraging your employees to clock in and out on time every time. Admin notifications can be found under the "Admin" tab on the Notifications Screen. Any Notification selected will be sent via email and shown as exceptions on the View Time Sheets screen in your dashboard. Most of the available Notifications are triggered when the times an employee clocks do not match the schedule you've created for them. So, in other words, you'll need to schedule your employees to take advantage of most of ClockShark's notification capabilities. A description of each Notification can be found below. It's worth noting that many customers choose to use only the time tracking features in ClockShark and communicate schedules to their employees using other means. That's perfectly fine to do, but you won't be able to take full advantage of the Notifications in ClockShark without using the Shift Schedules features. Setting up Notifications is easy. Visit the Notifications screen in your dashboard, make sure the "Admin" tab is selected, and place a check mark next the events you'd like to receive notifications for. Early Out: Notifies all administrators when an employee clocks out more than fifteen minutes before the scheduled end of a shift. Only works if the out punch is within one hour of the scheduled out time. Late Out: Notifies all administrators when an employee clocks out more than fifteen minutes after the scheduled out time. Missing In: Notifies all administrators when an employee is scheduled to work, but never clocks in. For schedules with a specified in/out time, the notification is triggered two hours after the scheduled start time. For all day schedules (no in/out time specified), the notification is triggered after 6:30 pm. Missing Out: Notifies all administrators when the system ends a shift automatically after 23 hours because no clock out was received. Note- disabling this notification only disables the notification. The system will always end a shift after 23 hours if no clock out has been received. Daily OverTime Alert: Notifies selected administrators when an employee has worked past the account's daily overtime threshold. Weekly OverTime Alert: Notifies selected administrators when an employee has worked past the account's weekly overtime limit. Unscheduled Time: Notifies all administrators when an employee clocks in but was not scheduled for the time and job chosen. Location Tampering: Notifies all administrators when a mock location was detected while an employee clocks in or out. Out of Bounds: Notifies administrators when an employee's GPS location is received from outside of a job's GPSFence. Unrecognized Face Detected: Appears on employees' timesheets when the face detected by ClockShark's facial recognition doesn't match the reference photo for the employee. Unapproved Time: Time was synced from an employee's phone to an approved timesheet. When all your Notifications are selected, you can decide which Administrators should receive the Notifications by adding their names to the "Notification Recipients (Admins):" field. You can turn on and off Admin Notifications by either checking or un-checking the "Send Admin Notification Emails" checkbox. Employee Notifications exist to help remind your employees to clock in and out. The notification can be sent as a push notification to their mobile device, an email or both. You can control how the notifications go out by adding a check mark to the "Mobile" and "Email" boxes next to each option. 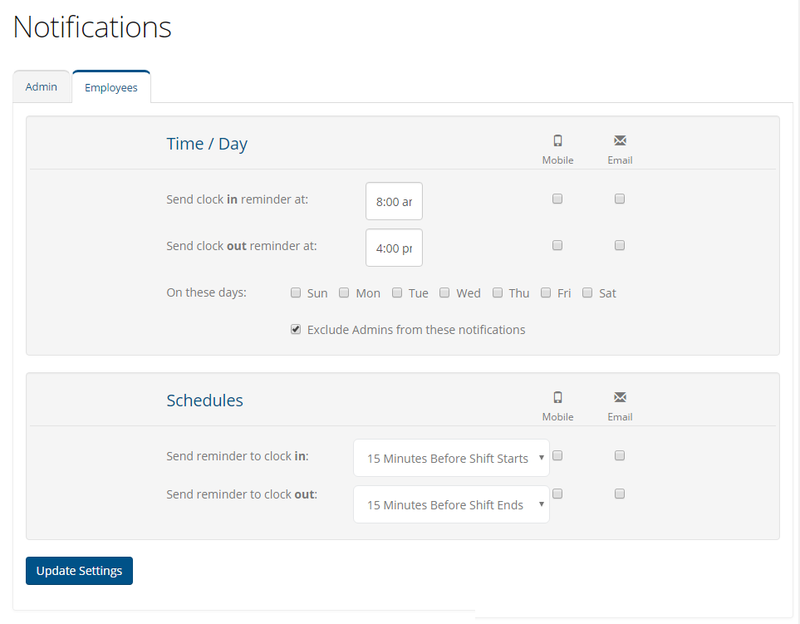 You can set the Employee Notifications to go out at a specific time everyday, like 8:00 am for clocking in and 4:00 pm for clocking out, or if you use scheduling inside of ClockShark you can send notifications based on the start and end times of each scheduled item. Your choices for schedule based notifications are 15 minutes, 30 minutes or 1 hour before each scheduled start and end time. The default is 15 minutes. If an employee is scheduled to work at Job Site A from 8:00 am to 11:00 am and Job Site B from 1:00 pm to 4:00 pm, they will receive a notification reminding them to clock in at 7:45 am and another reminding them to clock out at 10:45 am. In the afternoon they will receive another set of notifications at 12:45 pm and 3:45 pm.